Eventas Inc. provides comprehensive services related to events. Under the theme of "One-stop services for comprehensive promotion of events", the company conducts planning, design, production, and operation of events including exhibition, campaign and sports. Its business sections include "System Display", "Event, Exhibition, and Campaign", "Sign Business", "Design, Layout, and Remodeling", and "Sports Promotion". In late April, 2018, Eventas introduced "UCJV300-160", a Print & Cut UV-LED inkjet printer. Here is a story of how they came to this choice, how they operate it, and what products they print with it. Shift from aqueous printer can realize substantial cost reduction. New business challenge is possible with the technology further ahead of solvent printer. For this story, we interviewed Mr. Itoh, Manager, and Mr. Saito from a section named "V-sign". V-sign is a section which uses large-format printers to produce printed items and signs used for display, etc. The section name originated from an old drama, and was settled by a word from the supervisor, insisting "If you hear the word Sign, it obviously reminds V". Mr. Ito, Manager of the V-sign section explains; "Our section receives orders half from within the company, and half directly from clients. We deliver printed items to them respectively." Looking at the breakdown of application of the printed items, event-related items are the most common, followed by general signs and display boards. Not to mention jobs received directly from clients, they also receive jobs from a wide variety of industry sectors including major printing companies, business agents, and general contractors. They meet requests for short-term delivery of 3 days after receiving data, featuring agile and adaptable business style. The company is an old Mimaki user which has introduced "JV3" and "JV4" as well. 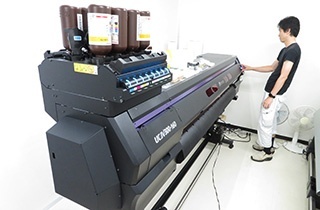 "UCJV300-160" is the 5th generation of Mimaki IJPs introduced. They have always used Mimaki printer, but this is the first UV curable IJP they have. It was introduced as a replacement for the aqueous "JV33-130". 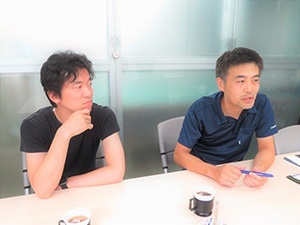 Mr. Itoh explains, "The aqueous printer had limited capabilities, and the demand has been gradually decreasing. Our business had a trend toward JV33, a solvent printer that had been already introduced. I had the idea that it is better to introduce a UV printer that has the technology further ahead of solvent printer." They also hoped to decrease the cost by omitting the laminating process. Especially for event display, products are scrapped after only 1 day use in some cases, which made them consider laminating is a waste considering the cost and environment. Furthermore, as dusts may be caught in the process of laminating, reducing such a risk was one of their objectives. UV ink does not penetrate to media after printing, which makes it easy to paste it up without laminating. UCJV300-160 is available at about 3 million yen, a very reasonable price as a UV curable product with cutting function. This also served as a spur for their decision on the introduction. Mr. Itoh looks back on the selection, "We considered a broad range of options including solvent, latex, and aqueous printers other than UV, and then narrow down the candidates." Mr. Saito sees the introduction of "UCJV300-160" as a challenge. "Introduction of a UV printer is a challenge for us. Although we do our jobs in a routine manner, we need to change gradually. Otherwise, we will be left out some other day, even if we survive today. Our office is located in the city core, with Morishita and Ryogoku nearby. We made our choice considering the advantage of printing in this area." So, what aspect of UV printer introduction was a challenge? First, they considered that UV is superior in supporting wide variety of materials and capability of printing directly on various media. This made them move on to a new challenge for supporting more diverse materials than before. Especially, print on wallpaper frequently used for exhibition has not been possible by the previous printers. 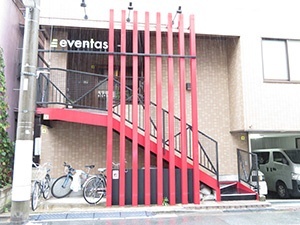 Eventas features package services including installation. Once it became possible to print on wallpaper, they came to replace the space-cutting finish process with printing a white base layer, which allowed them to deliver products by just shipping them out. This freed the company's staff from having to work in high places at the site and led to significant cost reduction. 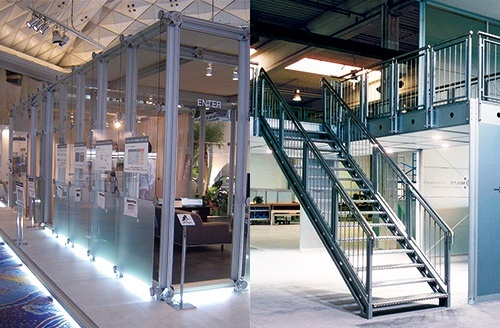 Mr. Ito also values it, saying, "Every company needs efforts to reduce personnel cost and man-hours. We had to consider the balance with our budget this time, but the purchase turned out to be a success, I think." Also, utilizing white ink allows them to print on transparent media, of which demand is growing in exhibition cases. 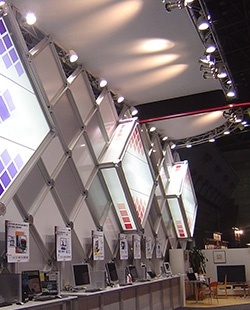 Eventas sells and rents an exhibition tool called "System Display" that is composed of aluminum and glass. As transparent media is often used for this glass part, the company can now propose a set of this system and print on transparent media. The Tokyo Olympics are set for 2020. While the Olympics are expected to bring a surge of orders, it may temporarily expose the company to a tough situation because its core business of display for exhibitions will slow down due to the unavailability of Tokyo Big Site from one year ahead of the Olympics. 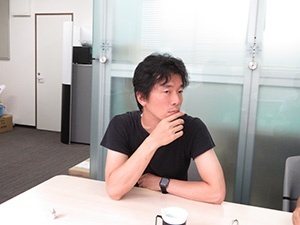 Mr. Itoh says, "Anticipating the situation where exhibitions are difficult to be held before the Olympics, we would like to be ready to respond to various demands. One of the measures for it is the introduction of "UCJV300-160"." As the company has lots of designers, they hope to generate various ideas and present excellent displays that can inspire customers. Eventas is attracting major attention for its efforts for flexibility in responding to various print cases and capability of proposing a variety of services. System Display excellent in design and its applicability. White ink of "UCJV300-160" increases expressive power of this system. IndustryPlanning, design, and installation of various types of events, and overall services associated with such events, planning to applying of signs and neon signs, planning and production of SP promotion items and leaflets, etc.